Ingrid Bengis-Palei smiles for a photo in her house in Stonington, Maine in this undated photo. Bengis-Palei, a writer once nominated for a National Book Award who later became known for providing fresh Maine seafood to renowned chefs died July 13 at the age of 72. Palei family photo. 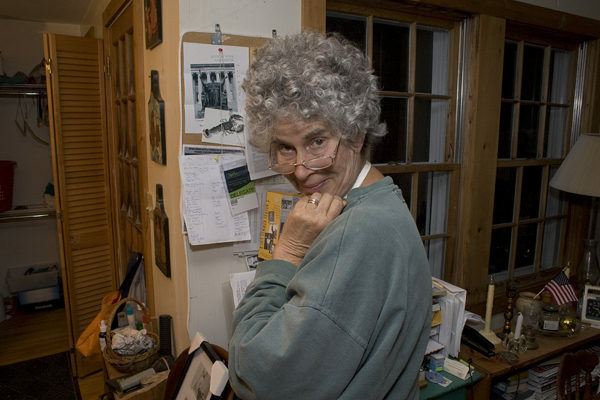 Ingrid Bengis-Palei, scholar, writer and the owner and operator of Ingrid Bengis Seafood, which has supplied top-quality seafood from the Gulf of Maine to the tables of the finest restaurants in the country since 1985, has died at the age of 72. Bengi-Palei passed away July 13 at her home in the Stonington village of Oceanville, where she moved in the 1970s to escape the chaos of her native New York City. Private services and burial were held at Stonington Mount Rest Cemetery, according to her obituary. Wesley Norton, executive director of a local nonprofit Edible Island, the board of which was chaired by Bengis-Palei, said Wednesday the cause of death was cancer. She was diagnosed with the disease in 2015. Bengis-Palei came into her business as a fishmonger somewhat unexpectedly. In a 2002 profile in Saveur Magazine, she noted that she initially offered to supply foraged wild chanterelle mushrooms to Balducci’s, a now-closed gourmet food market in Manhattan. The owners asked her whether she could also supply them with fresh lobsters. That request quickly snowballed into more requests from more restaurants for lobster, crab, cod, halibut, scallops and mussels. As word of the quality of her seafood grew, Bengis-Palei began to supply the finest restaurants in the city with the freshest catch from the Gulf of Maine, seafood she often personally flew into New York from Bangor International Airport and delivered by hand to her clients. In 1986, she began to supply seafood to Le Bernadin, long considered the finest restaurant in New York City and holder of three Michelin stars for the past 30 years. She also supplied seafood to world-renowned chefs, including the likes of Jean-Georges Vongerichten, Wolfgang Puck and Thomas Keller. Keller, best known for his restaurant The French Laundry in Napa Valley, posted a photo of Bengis-Palei on his Instagram account the day after she died. He said he bought lobster from her for more than 20 years. Bengis-Palei partnered with lobstermen, fishermen, clam diggers and crab pickers from Deer Isle and Stonington, developing personal relationships with her suppliers that she demanded her chef clients understand and respect. Mark Bittman, the acclaimed food writer, described a visit with Bengis-Palei in Stonington in a 2011 blog post. In 1991, she was among a group of four writers with other careers who were interviewed by Charlie Rose. A 2003 article, also for New York Times Magazine, mentions Bengis-Palei’s acquaintance with Norman Mailer, her travels to Nicaragua, France, Mexico and Russia, and her relationship with famous chefs who valued her exacting standards for the fresh seafood she provided them. Jesse Leach, owner and operator of Bagaduce Oyster Company, said Bengis-Palei was the first person to buy his oysters after he started growing them commercially in the late 1990s. She was particular about what she would buy, he said, but offered him 10 cents more per oyster than what he was asking for. David Tarr, a Brooklin scallop diver who sold his catch to Bengis-Palei, said Thursday that he and his family once went to eat at a Denver restaurant that she sold seafood to and saw that his name was printed on the menu. Bengis-Palei founded Edible Island in 2009 because she wanted to promote the sustainable production of food in the Deer Isle area and to teach young people how to make a living off it, according to Norton. Bengis-Palei was a Fulbright Scholar and since the early 1990s spent two months each year in Russia, teaching 20th century American literature at St. Petersburg State University. She is survived by her husband Edouard Palei, a Russian ballet dancer to whom she was married for 19 years, her son Paul; daughter-in-law Olga; and two grandchildren, Mark and Stefan. BDN writer Bill Trotter contributed to this story.